While shopping for bananas and apples, I came across some lovely packed carrots and just couldn’t resist the urge to buy. 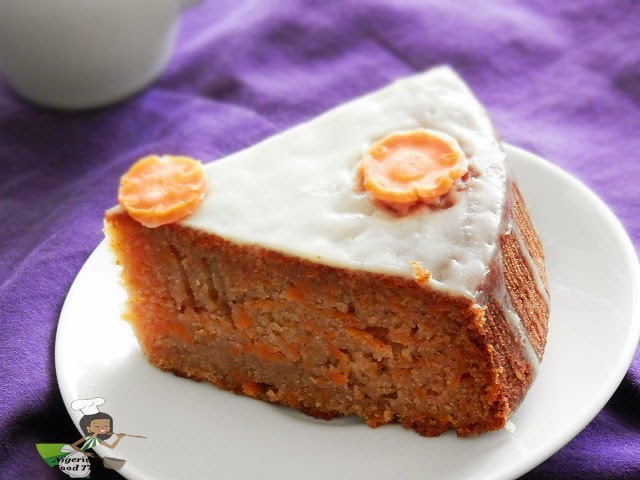 They were about 30 medium sized carrots in the pack, which was more than what I needed for the weekends’ fried rice and coconut curry sauce, so I decided to make this tasty carrot cake. I’m not one to brag about my baking, but this carrot cake was so delicious, that my neighbor paid me to bake two large ones for her daughter’s engagement party in Valencia (about 8 hours drive from us, t&f). Unlike this one below, the cakes were frosted and had to be transported by road; I only hope the cakes made it safe and also hope you try out the recipe below☺. 1a. First preheat the oven at 180ºC or 350ºF. b. Prepare the pan by first greasing the inside with butter and then dust lightly with flour. 4. 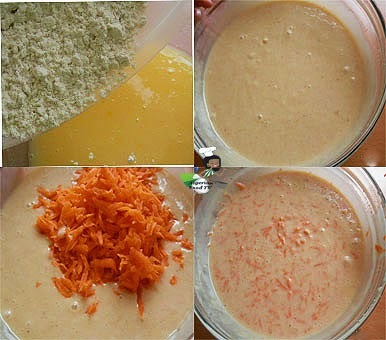 Then gradually add the flour mixture; mix well and finally add the grated carrots.Mix lightly until well incorporated and pour into the prepared pan. Let the cake cool for a few minutes, then turn onto a rack and leave to cool completely then serve and enjoy. If you don’t have an oven, remember that you can also bake this cake on a stove top using the method described HERE. I love your comments and feedback, feel free to drop me a line ☺. Wat size of cake will this recipe make? Hi dear, this is awesome! How can i the recipes on my email? You can leave it out if you don’t have any . How can I subscribe to be getting recipes through my email. Nice one. Will sure try this out. Have an order for one soon. you're too much dear, pls may know the white thing on top of the carrot cake and how to prepare it.thanks. Hello Nky, thanks for the recipe but do really mean 1 tbsp nutmeg, n 1 tbsp cinnamon or 1tsp sorry pls am a bit confused won't it be too much ma? Hi Oladimeji, its 1 teaspoon ground nutmeg and 1 teaspoon cinnamon, thanks for the insight dearie and i'll be expecting your feedback. Just wonderful dear…yet to bake a cake but will surely try this….Gisike nne!! Add 2 to 3 tablespoonful of powdered milk to the flour and you are good to go. Thanks for the recipe. My question is what brand of vegetable oil is best? Hi Zippy, honestly the best brand is any one you can afford. Good evening Nky.I really feel like giving you a big hug for the job well done on this site. u inspire me to learning the art of baking which I never tot of at all. Everyfin is simply explained. My only question is abt the measurement.without a scale, how does one get the measurement ryt? Hello Nky,i finally baked dis stomach filling cake.its moist and filled Wt nice flavor and i sent u d pic.i want to make dis cake again,bt I want to add dried fruit.I know the fruit has to be soaked in rum for 3 days.my question is do I add the fruits togeda with d alcohol to the cake batter when baking or should I rinse off the alcohol b4 adding to batter.God bless. Ok….i just resent d pics to dis address-nigerianfoodtv@gmail.com.thank you. Can I use brown sugar for dis recipe? Hello ma,i want to know if the tablespoon you used for baking powder and soda is just the normal stainless tablespoon in our kitchen that has been leveled or a measuring spoon(15ml,leveled). In the absence of a baking pan what can one use? You can make use of an aluminium foil container , like the one in the picture above. Chy, You are too much, more grace! When will u post recipe for red velvet cake. Nice job u re doing. 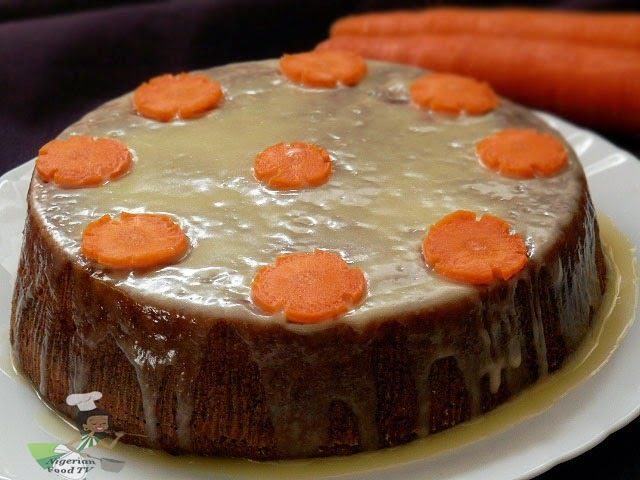 what did you put on the cake…mayonnaise and carrot? That's what I call a carrot cake. You are just too much. Your recipes are always on point, thanks for this one too .